Sponsored by New Canaan Crew and Maritime Rowing Club. MRC, NCHS and SLS competitors must be at the boathouse by 6:45 a.m. (unless told otherwise by coaches). The first heat launches at 7:45, with the race starting at 8:30. Thank you for volunteering to assist at the regatta on Saturday! From 95 or Rt. 7 South, follow the signs to SoNo (South Norwalk). Follow West Avenue South until it forks to the left, which is North Main Street. There is a left turning lane with a signal arrow. Make the left onto North Main Street. Proceed South to Washington Street (under the Metro North tracks.) 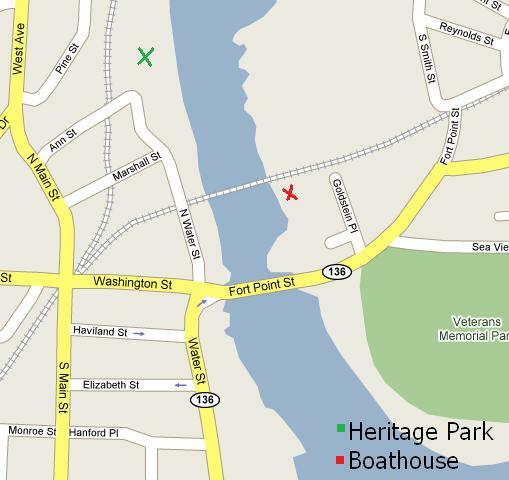 Make a left and proceed east on Washington Street, over the Draw Bridge, where it turns into Fort Point Street. Once you are over the Draw Bridge, make first right into Veteran's Park parking lot. From Veteran's Park, cross Fort Point Street and enter small shopping area on Goldstein Place. Proceed to the boat yard at the end of Goldstein Place, and make a left. The New Canaan Crew/St. Luke's/Maritime Boathouse is the last building on your right, and is clearly marked. Heritage Park is just North of the Norwalk Maritime Aquarium. From 95 or Rt 7 South, follow the signs to South Norwalk. Follow West Avenue South until it forks to the left, which is North Main Street. There is a left turning lane with a signal arrow. Make the left onto North Main Street. At the first traffic light, make a left. You've arrived at Heritage Park.